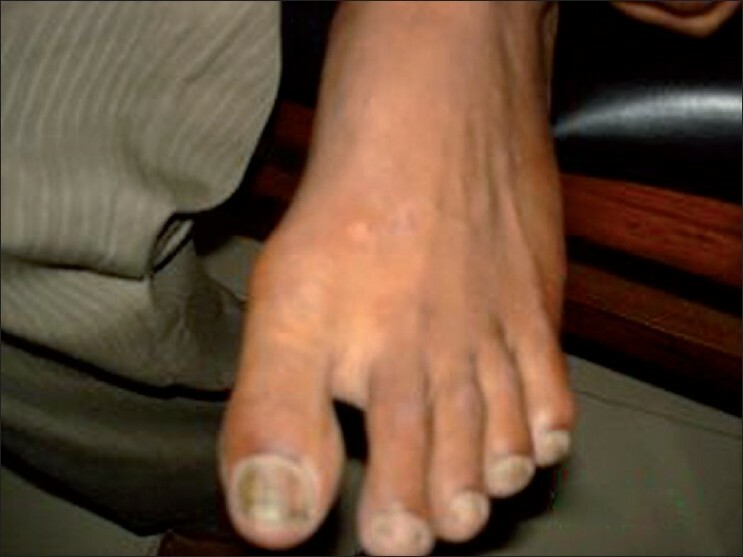 Background: Warts are caused by various strains of Human Papilloma Virus. They involve the epithelium of the skin and mucus membrane. Various treatment options are available, but extensive and recalcitrant warts not only cause distress to the patient cosmetically and psychologically but also pose a therapeutic challenge to the treating dermatologist. Aim: To evaluate the efficacy of autowart injection as a treatment option for extensive and recalcitrant warts. Materials and Methods: Autowart injection was prepared by removing 3 to 4 mm size wart with radiocautery which was crushed under aseptic condition and injected in the gluteal region by suspending in water for injection. Result: Results were evaluated in 53 available patients who turned up for follow-up; 35 patients (66.03%) had complete resolution in 2 months time, 12 patients (22.64%) showed partial improvement, whereas six patients (11.32%) had no improvement. 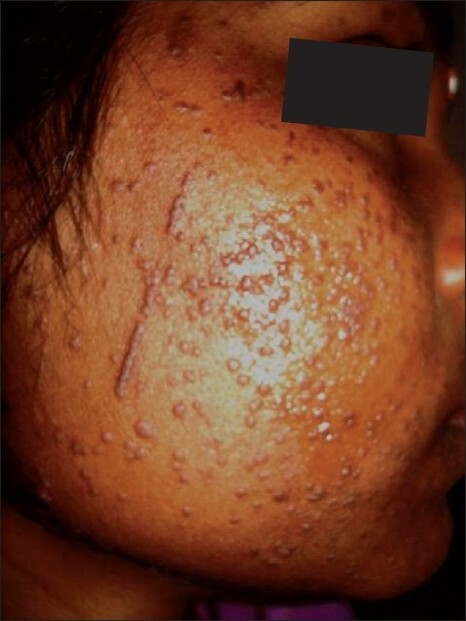 Conclusion: Autowart injection is suggested as an effective and noninvasive therapeutic option in extensive and recalcitrant warts where most of the available therapies are inconvenient for both patient and treating dermatologist. Inspite of various therapeutic modalities being available, no single therapy has been found to be efficacious and cosmetically acceptable in majority of the patients. 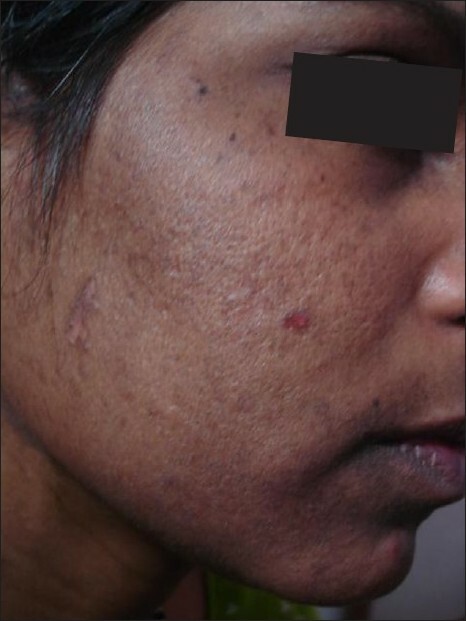 , With this background and introduction, autowart injection as a treatment option is proposed for recalcitrant and extensive warts. A total of 62 patients (age group 10 - 57 years) were selected for autowart injection. Of the 62 patients, 37 were males and 25 were females. Before the therapy each patient was counseled in detail and written consent was obtained. Exclusion criteria were pregnancy, lactation, immunocompromised state, intake of immunomodulatory drugs, and children <10 years of age. The duration of disease was between 1 to 3 years and all the patients were not responding to other modalities of treatment. All relevant investigations were carried out in patients, and patients were explained about the therapy. It was ensured that no other medication had been taken by the patients 4 weeks before autowart injection. Under aseptic condition, local anesthesia was given and 3 to 4 mm of wart tissue was taken out by radiocautery machine and placed on sterile gauge. The tissue was then crushed in pastel and mortar with distilled water. A fine suspension was prepared and taken into the sterile disposable syringe and injected into the gluteal region. Patients were asked to follow-up initially after one week, one month, and finally after 2 months. The complete resolution of warts after 2 months time was considered successful treatment. Of the 62 patients, nine were lost to follow-up and 53 patients were available for evaluation. Thirty-five patients (66.03%) had complete disappearance of warts and 12 (22.64%) showed partial improvement (reduction in numbers and size of warts). Six patients (11.32%) had no improvement at all. In seven patients who showed partial improvement, further auto wart injection did not cause resolution of warts. No apparent side effects were observed [Figure 1],[Figure 2],[Figure 3],[Figure 4]. An autowart injection is the easiest, minimally invasive technique where autowart injections are prepared and injected intramuscularly, and can be used as an outdoor procedure/office set-up. This possibly enhances the immune status which results in the resolution of warts at a distant site. Though this therapy seems to be quite effective, a double blind randomized control trial will provide further evidence of its efficacy. 1. Plasencia JM. Cutaneous warts: Diagnosis and treatment. Prim Care 2000;27:423-34. 2. Sterling JC, Handfield-Jones S, Hudson PM. Guidelines for the management of cutaneous warts. Br J Dermatol 2001;144:4-11. 3. Kuykendall-Ivy TD, Johnson SM. Evidence-based review of management of nongenital cutaneous warts. Cutis 2003;71:213-22. 4. Gibbs S, Harvey I, Sterling J, Stark R. Local treatments for cutaneous warts: Systematic review. BMJ 2002;325:461. 5. Horn TD, Johnson SM, Helm RM, Roberson PK. Intralesional immunotherapy of warts with mumps, candida, and trichophyton skin test antigens. Arch Dermatol 2005;141:589-94. 6. Shivkumar V, Okade R, Rajkumar V. Autoimplantation therapy for multiple warts. Indian J Dermatol Venereol Leprol 2009;75:593-5.